Seattle is a fairly artsy city filled with art galleries large and small – some are new, and some have been around for decades, so those seeking to take a self-guided tour of the city’s art scene have a strong selection to choose from. Glass art especially is worth checking out in Seattle due to the presence of world-class glass artists such as Dale Chihuly and the Pilchuck Glass School. No matter what kind of art attracts you, you’ll likely find a gallery to explore. If you’re not sure where to start or you’d like to see more than one gallery, the best option might just be to join in one of the city’s gallery walks. Each neighborhood has its own gallery walk so you don’t have to go far, but Pioneer Square by far has the greatest density of galleries and its First Thursday Art Walk is the biggest and best in town (you even get free parking). And to help you on your way, here are 10 of Seattle’s best art galleries. One of Seattle’s oldest galleries, Foster/White is more upscale than many of its neighboring galleries in Pioneer Square, and has a light and airy feel to the space. And it’s an essential stop on your route. Artwork on display ranges from contemporary paintings, to sculptures to glass art, and features both well-established artists as well as those still emerging. Foster/White makes a fine stop on Pioneer Square’s First Thursday Art Walk, but it’s also open during regular hours from 10 a.m. to 6 p.m., Tuesday through Saturday. The Henry Art Gallery is located on the University of Washington campus and is another of Seattle’s older galleries, having opened in 1927! While it has expanded since the 1920s, it’s still not a large gallery by any means. Instead, this gallery aims to challenge and fuel questions and inquiry. To that end, you’ll find not only exhibitions, but also talks and presentations, film screenings, workshops, and even family and teen events. There is a $10 admission fee ($6 for seniors) and also a café inside where you can enjoy beverages, sandwiches and salads. Chihuly Garden and Glass is one of the finest places to view artwork if you’re a fan of handblown glass. As the name implies, this is a display of local glass artist Dale Chihuly’s artwork and it spans both indoor and outdoor spaces. 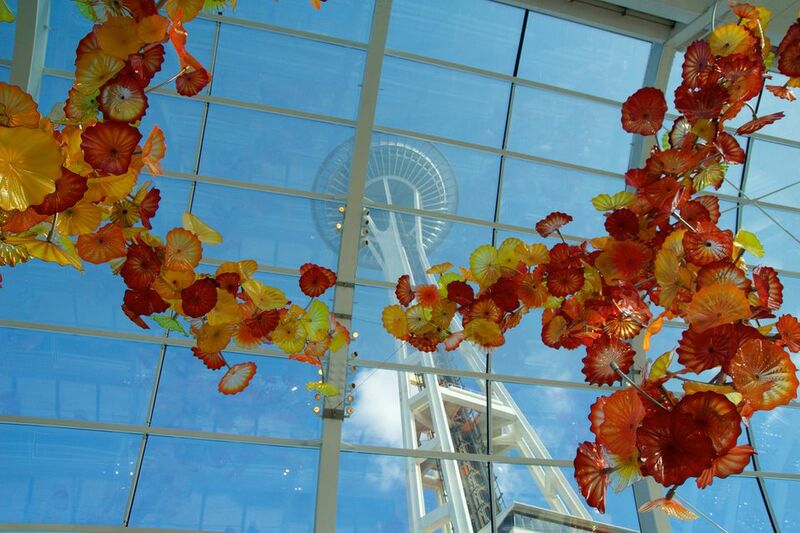 Admire bright orange floral shapes inside the glasshouse against a backdrop of the sky and Space Needle right above. Step outside and wander through gardens highlighted by Chihuly’s colorful glass forms that range from a bright sun-like installation to playful glass shapes among flowers to stately spears of glass. Eight indoor galleries also showcase more of his works and you’ll also find walls of Chihuly’s drawings too. The gallery also has a café where you can view more drawings as well as items from Chihuly’s personal collections, and a bookstore where you can purchase books, DVDs and even smaller versions of Chihuly’s work called Studio Editions. Roq La Rue Gallery was started by Kirsten Anderson in 1998 with the idea of a space devoted to “low brow” art, meaning everything from underground cartoonists to prison art and counter culture. As it grew, the gallery’s focus shifted into what became known as “Pop Surrealism.” The gallery has had four locations over the past couple of decades, and even closed down for a couple of years. Today, gallery visitors will find pieces unlike what you’ll see in most other galleries in Seattle with artwork by artists like Debra Baxter and Lola Gil – local artists and international artists alike. Shows rotate monthly and there’s also a shop with smaller works of art to explore. Ghost Gallery offers a counter to the more upscale galleries on this list as it tends toward affordable and accessible to all, yet still features curated collections that speak to unique and interesting themes. Sharing an entrance with Cupcake Royale (yet another bonus) in Capitol Hill, the gallery focuses on local and regional artists in a wide variety of media from paintings to jewelry, and from very affordable up to a few hundred dollars per piece. And as a special bonus, Ghost Gallery special is that it also sells bottled wines and tarot. Traver Gallery is one of Seattle’s best-known galleries by far. It’s been open for more than 40 years and brings in many well-respected national and international artists, as well as those at the beginning or middles of their art careers. The gallery keeps its focus on studio glass, painting, sculpture and installation pieces and, as such, is an excellent stop for anyone wanting to delve into the Northwest’s relationship with glass artists. You’ll regularly spot artwork by Dale Chihuly, Preston Singletary, Lino Tagliapietra, William Morris and other glass greats from near and far. You’ll likely also discover someone new. Located near Pike Place Market, Vetri is the sister gallery to the Traver Gallery and was founded in 1996. While it started out with a focus on studio glass, it now also showcases ceramics, jewelry and other artforms. Vetri curates both functional and decorative forms, so it’s a great place not only to peruse but to shop if you’re looking for a unique gift. Hand-blown candle holders, handmade jewelry, bowls, mugs,wine glasses and vases are all frequently spotted on display. Located in Pike Place Market, Northwest Tribal Art is a gallery that features museum-quality artwork from Northwest native tribes, including the Makah, Tlingit, Salish and others. You’ll find prints, carvings, jewelry, masks and more. Bonus, you can also learn more about the native cultures from the area, too. The shop’s website includes a list of symbols in native artwork complete with explanations and it’s best to take a look at these before you go so you have more context for the pieces at Northwest Tribal Art. Seattle has so many galleries that choosing just one might be a little tough, but that’s when a place like ’57 Biscayne comes in. With 13 artist studios located in a single building, ’57 Biscayne is the perfect way to jump on into the art scene. Artists include a bit of several art media, so you might see painters, printmakers, a book maker, jewelers, a videographer, photographers or others in residence or with work displayed. The galleries aren’t always open to the public, but they open for viewings at least twice a year. Like ’57 Biscayne, the Tashiro-Kaplan Artist Lofts (known fondly as the TK) are home to a number of individual artists all in one spot who open their galleries or studios to the public. Even if the galleries aren’t open, this light and airy space is filled with art you can see simply walking the hallways as the artists are encouraged to decorate the exterior walls and doors to their spaces. The TK is a major stop on the Pioneer Square Art Walk, but the art galleries and studio spaces are open at other times for public visits. Galleries include nonprofit contemporary SOIL; Gallery 4Culture which showcases underrepresented art; and Center on Contemporary Art (CoCA).